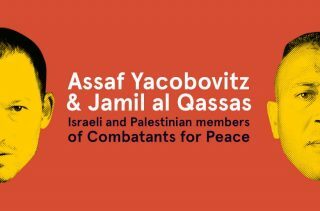 The seventeenth Freedom Lecture is being held by Palestinian Jamil al Qassas and Israeli Assaf Yacobovitz, both active within the Combatants for Peace movement. This organization was founded in 2006 by (former) Israeli soldiers and Palestinian combatants, who decided to lay down their arms and by means of nonviolent protest speak out against the occupation. Combatants for Peace cooperates towards a peaceful solution for both populations. What makes Combatants for Peace so exceptional is that in an extremely polarized and unequal environment, people dare to think across the boundaries of their own in-group. Compassion and empathy are not only key concepts for the organization, but in the case of the Israel-Palestine conflict, almost revolutionary. Despite the huge resistance within their own group and the political reality of violence on both sides, Combatants for Peace stays committed towards a peaceful solution, because they believe in a long term strategy where eventually our common humanity will triumph. In times of global polarization where different groups seem to live completely in their own reality and point out the other as the scapegoat, we are going to engage in a conversation between Al Qassas and Yacobovitz about their radical belief in the strength of empathy.